Elfrid Payton's strengths and weaknesses are fairly cut and dry on paper. Payton played a high usage role ranking 3rd among point guard prospects using 20.9 possessions per-game. He finished 1st among his peers using 5.1 possessions per-game in transition and shooting 63.4% on the break as his size and athleticism made him a dynamic threat in space in the Sun Belt conference. Despite ranking 3rd shooting 45.2% from the field in the half court, he finished 3rd last scoring .828 points per-half court possession. This disparity is the result of his limited jump shooting ability. Although he attempted just 3.2 jump shots in the half court per-game, the 4th least in this sample of players, he made a group low 25.7% of those attempts. His 18.2% conversion rate on catch and shoot jump shots obviously leaves a lot to be desired, and as we saw in our workout interview with the tall, athletic young guard, that is an aspect of his game that he's focusing on improving ahead of his rookie year. Although he did get to the free throw line at the third highest rate in this group, the fact that he converted just 59% of his attempts once there made that somewhat for naught. A detailed video analysis by Mike Schmitz of how Louisiana-Lafayette's Elfrid Payton performed in his match ups against the elite competition. Playing in a low major conference, Payton didn't face NBA talent on a nightly basis, so we take a close look at the occasions that he did. We joined Elfrid Payton as he works out in preparation for the 2014 NBA Draft, and discussed a number of topics with him, including what he's trying to improve on in the short-term and what he feels he can bring to a NBA team. Elfrid Payton's NCAA career likely ended this weekend with a loss to Creighton in the Round of 64. We can now take a step back and conduct an inventory of everything he displayed this season as an NBA prospect, as well as the things he still has to improve on. Payton stands out first and foremost thanks to the excellent physical tools he brings to the table as a point guard prospect. He measured 6-4 in shoes with a 6-7 wingspan by USA Basketball last summer, and is a very good athlete as well, showing great quickness in the open floor and the ability to play above the rim with ease. Payton is a very good ball-handler, which makes him an excellent transition threat and allows him to get into the paint very effectively. He can create his own shot and break down defenders in pick and roll and one situations, showing good potential in this area as he continues to mature and polishes up his skill-level. Despite averaging over 19 points per game, Payton looks very comfortable as a facilitator as well, utilizing his size very well to see over the top of defenses and solid court vision executing a variety of passes. He's obviously an unselfish player, sometimes to a fault, which we'll get into later. Perhaps Payton's most attractive and likely also his most NBA-ready skill is his defense. He takes great pride in his work here, showing a high intensity level and extremely quick feet laterally, which allow him to get over the top of screens, and also stay in front of opponents on the perimeter. Payton has long arms, big hands and solid anticipation skills, which shows up in his ability to get in the passing lanes. He also contributes on the glass as you'd expect with his strong physical tools, which gets his team quite a few transition opportunities when he's being aggressive. Payton showed great versatility in college, often being asked to guard point guards through power forwards, as he displayed in the NCAA Tournament with some very solid possessions matching up with Doug McDermott. He'll get even better here as he continues to gain weight, as he has a thin frame at the moment which has yet to fill out. One of the most interesting things about Payton is how incredibly young he is. He enrolled at Louisiana Lafayette as a 17-year old, and is thus only three weeks older than freshman Joel Embiid, two weeks older than sophomore Marcus Smart, and six months older than freshman Tyler Ennis. A very late bloomer, he made huge strides with his game between his freshman and sophomore seasons and then again between his sophomore and junior seasons, so it's very legitimate to wonder how much he can still improve in the next few years in a NBA system. With that said, Payton still has his fair share of weaknesses, some of which could be quite damaging to his pro prospects if he's unable to address them in the next few years. The most glaring is his outside shot, which is simply not a weapon by any means at this stage, as evidenced by his 26% 3-point and 59% free throw percentages. Opposing defenses regularly sag off him significantly daring him to punish them from the outside, which he's unable to do at the moment. He's also not an extraordinary finisher around the basket in the half-court, particularly considering the level of competition he plays at and the physical advantage he regularly enjoys. His lack of strength and avoidance of using his left hand contributes here, but he's also a little bit passive in the way he chooses to attack defenses at times, settling for floaters, not initiating contact, and not looking as fearless as you might hope inside the paint considering his limitations as a shooter. There are some concerns about how much of a scorer in general he might be in the NBA. Payton's lackadaisical approach shows up in his very high turnover rate, which ranks 2rd amongst Top-100 prospect point guards. He gets a little careless with the ball at times, making lazy passes or not protecting the ball effectively, which is somewhat a product of his laid-back demeanor. After playing only seven games this season against Top-100 competition, NBA teams will be eager to see Payton in private workout settings matched up against other elite point guard prospects to get a better handle on how he actually stacks up. He has some very intriguing attributes, along with some notable flaws, which make his true draft range a little difficult to peg precisely at the moment. Matchups against the likes of Louisville, Baylor, Creighton, Arkansas, Louisiana Tech and Georgia State have given us ample opportunity to evaluate Payton's very defined strengths and weaknesses as a prospect, which we've done in the following video scouting report, courtesy of Mike Schmitz. 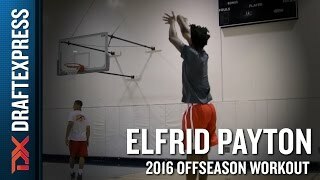 The last player added to the roster as he initially snuck under the radar due to the fact that he's a rare rising college junior who is 19 years old, Louisiana-Lafayette point guard Elfrid Payton was an interesting find here, and someone we'll surely be keeping close tabs on in the future. Sporting excellent size for a point guard at 6-4, to go along with a long wingspan and an underdeveloped frame that should fill out nicely in time, Payton is a solid athlete with nice versatility on both ends of the floor. He's a talented ball-handler who can create his own shot effectively in the half-court and is excellent in transition, allowing him to play above the rim with regularity. He has a good first step and solid playmaking instincts, giving him nice potential on the pick and roll when combined with his intriguing creativity. Still a fairly raw prospect, Payton has plenty of room to improve as a perimeter shooter, only making sixteen of his fifty 3-point attempts during his freshman season after not making a single outside shot as a freshman. His mechanics don't look all that bad, so he could likely improve this facet of his game with repetition. He clearly lacks experience against high-level competition, as his left hand is underdeveloped, he can be somewhat turnover prone in the half-court, and he doesn't always have the strength to finish everything he creates for himself around the basket. Where Payton might show the best potential long-term is on the defensive end, as his excellent size, long arms and strong anticipation skills allow to make plenty of plays in the form of steals, blocks, rebounds and deflections. He shows very good instincts here and could develop nicely on this end of the floor as he continues to get stronger and garner more experience. A pleasant surprise here, Payton brings a dimension of size, athleticism, creativity and versatility on both ends of the floor that Team USA might be able to utilize, even if his inconsistent perimeter shooting might not be the best fit for international basketball. Nevertheless, he'll be a prospect NBA scouts will want to follow closely next season.